Google recently launched a campaign across its whole platform to celebrate the pending release of Star Wars: The Force Awakens. Users are able to visit Google's Star Wars portal, where they can choose between the Light or Dark Side of The Force. Once you have decided, Google's various apps change to match your choice. The search giant has also hidden a few easter eggs in its various services. 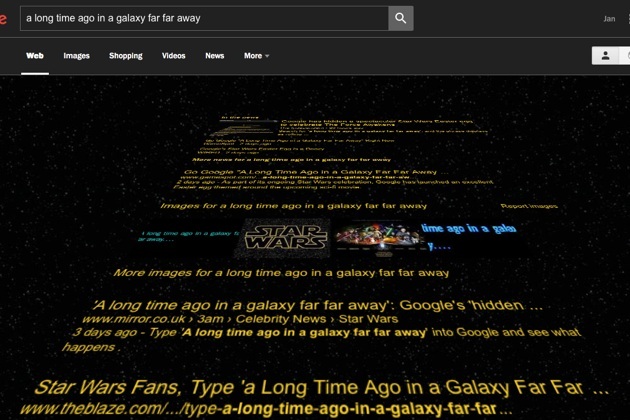 Typing "A long time ago in a galaxy far far away" into Google search causes the results page to be displayed in the angled style of the iconic Star Wars opening crawl. Google Translate has also added Aurebesh, a writing system from Star Wars, to the list of languages it supports. Google lets you can translate to and from Aurebesh.